Two men who normally only meet behind closed doors were front and centre at the University of Windsor Monday. A prominent management labour lawyer George King and the CAW's president Ken Lewenza squared off in a debate about the future of Ontario's manufacturing industry. King said it may be too late to save and create manufacturing jobs. He said the union's short-term focus during last year's contract negotiations with the Detroit Three may have negotiated Canada out of future, long-term investment. "I think there's a potential for that, Ken can talk about the monies being spent [by companies] but the bottom line is [that] there's big investment going in Detroit, big investment going in Kansas City," King said. The trio of contracts the CAW signed with the automakers offered little investment and few new jobs in Ontario. Chrysler recently said the company's next generation minivan will still be built at Windsor Assembly Plant, which employs about 5,000 people, most of the unionized. However, in November, Chrysler's CEO announced 1,200 new jobs for Michigan. 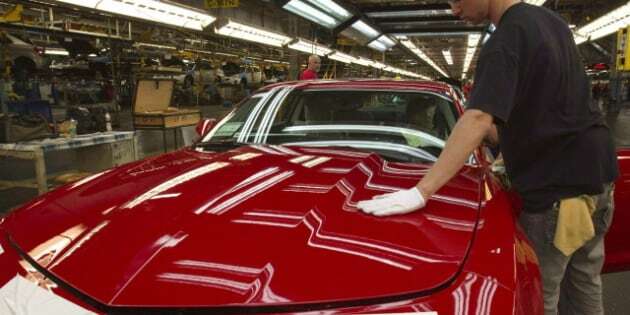 A month later, GM announced future production of the Camaro was shifting from Oshawa to Lansing, Mich.
Ford also has expanded several plants and added 2,200 jobs in the U.S. In an effort to turn the tide, Ottawa offered up $250 million in the Automotive Innovation Fund. Lewenza said the continued focus on union wages is just plain wrong. "Four percent of the total cost of a car, $1,800, is labour," Lewenza claimed. "And if that makes the difference between a successful company and an unsuccessful company, we're in trouble." Lewenza said Canada should investigate what Germany has done to keep manufacturing strong and what Brazil is doing to expand their manufacturing industry. "If we don't look at what other countries are doing, and it's just basically decided on labour rates, then, quite frankly, they'll be no industry here in 10 years," he warned..
King said the labour rate issue is already decided. "I think what's gone are the days where people that are working in low-skilled jobs are going to be able to command high high salaries based simply on unions being able to negotiate big increases," he said. "Those days are gone."